Edit a Page or Post and click in the content area where you want the image to appear. The screen changes to Create Gallery. Click the images you want to add to the Gallery. If desired, click the Upload Files tab and upload images. 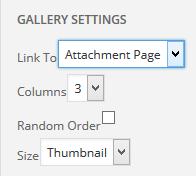 In the right column, click Create a new gallery. The Edit Gallery screen appears. In the middle column, change the “Caption this image” text to captions for the photos. Click Insert Gallery. The Edit Gallery screen closes and the gallery appears in the page. Click in the editor. The gallery background turns gray, and a two icons appear – a pencil and an “X.” Click the pencil icon. The Edit Gallery screen appears. Below an image, you will see the text “Caption this image.” Click on the text, and it will disappear. Type the caption. Click the “X” in the upper-right corner of the photo. In the left column, click Add to Gallery. Select files from the Media Library or Upload Files.